Blue baby with multiple complications and Levocardia. This medical exhibit shows several images related to Summary of Injuries and Complications. File this medical image under: Summary of Injuries and Complications. 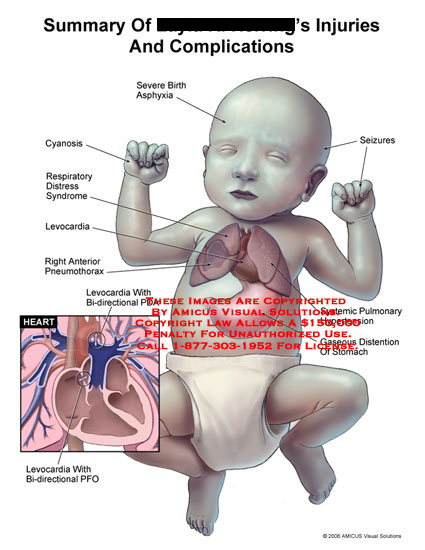 This image shows illustrations related to injury summary injuries baby fetus complications cyanosis blue asphyxia seizures pneumothorax levocardia hypertension gaseous distention stomach PDA PFO foramen ductus patent heart. Title: Summary of Injuries and Complications, © 2008 Amicus Visual Solutions. Description: Blue baby with multiple complications and Levocardia. Keywords: amicus visual solutions, injury, summary, injuries, baby, fetus, complications, cyanosis, blue, asphyxia, seizures, pneumothorax, levocardia, hypertension, gaseous, distention, stomach, PDA, PFO, foramen, ductus, patent, heart. Tags: amicus visual solutions, injury, summary, injuries, baby, fetus, complications, cyanosis, blue, asphyxia, seizures, pneumothorax, levocardia, hypertension, gaseous, distention, stomach, PDA, PFO, foramen, ductus, patent, heart. File under medical illustrations showing Summary of Injuries and Complications, with emphasis on the terms related to injury summary injuries baby fetus complications cyanosis blue asphyxia seizures pneumothorax levocardia hypertension gaseous distention stomach PDA PFO foramen ductus patent heart. This medical image is intended for use in medical malpractice and personal injury litigation concerning Summary of Injuries and Complications. Contact Amicus Visual Solutions (owner) with any questions or concerns. More illustrations of Summary of Injuries and Complications are available on our website listed at the top of this page. If you are involved in litigation regarding Summary of Injuries and Complications, then ask your attorney to use medical diagrams like these in your case. If you are an attorney searching for images of Summary of Injuries and Complications, then contact Amicus Visual Solutions to see how we can help you obtain the financial compensation that your client deserves.